Owning and operating a Bed & Breakfast is a lot of work, and a lot of fun. We enjoy meeting and serving people. A big part of what we do is make our place a nice place to be at. So we have worked inside the house, and outside in the yard. Outdoor work has involved a lot of landscaping changes, as well as regular maintenance. Lately I we have cleared out the space behind the barn, and removed weeds, and made a place ready to store firewood. This week I had two cords of firewood delivered (dumped on the yard), and it took me (parts of) three days to stack it. Also this fall I have been working on the front yard, trying to get grass to grow where there had been moss before. But now it is the time of the year for the Grand Oak tree to shed/drop its acorns. They have been dropping since July, but those early ones were small. In the last six weeks the acorns have been falling. The tree hangs over the sidewalk and the road, so pedestrians and vehicles alike are at risk of being hit by falling nuts. 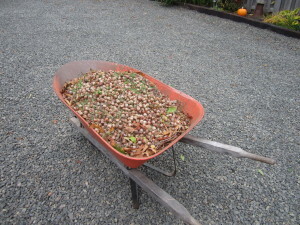 There are so many acorns that it is very uncomfortable to walk on the grass in the front yard, or on the sidewalk. So I clean them up. It is painstaking work. But necessary. This was written in October. Now it is November 16. The acorns have all fallen. Here are some of them. At this points I have gathered at least four wheelbarrow loads of them. There are so many more that it could easily be two more loads. Wow!